Miss Olangapo City, Angelee dos Reyes (25) beat 46 other delegates to be named Miss Philippines Earth 2013 at the conclusion of the annual pageant that finds the Filipino who will represent her country at the Miss Earth World Final. Miss Air Philippines is Kimverlyn Suiza from Nagcarlan. Nancy Leonard, Miss Zamboanga City, was named Miss Earth Water while Miss Filipino Community of the West Coast of the USA, Alma Cabasal was named Miss Earth Fire. 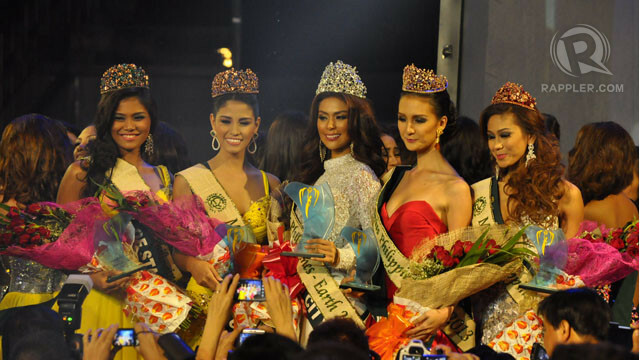 Bernadette Aguirre who competed as Miss Santa Maria was named Miss Philippines Eco Tourism. Great top 5! The winner is very deserving and she should do well at Miss Earth!